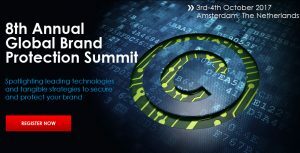 SofMat Ltd will be attending the ‘Global Brand Protection Summit’ in Amsterdam on Tuesday 3rd – Wednesday 4th October 2017. The company’s Managing Director Dr Philip Harrison will be available at the event to answer questions on the SofMat patented platform technology and discuss how SofMat can help your company with bespoke solutions to your brand protection / anti-counterfeiting challenges. Anyone wishing to pre-book a meeting slot with Dr Harrison please do get in touch before the event using our ‘Contact’ form.